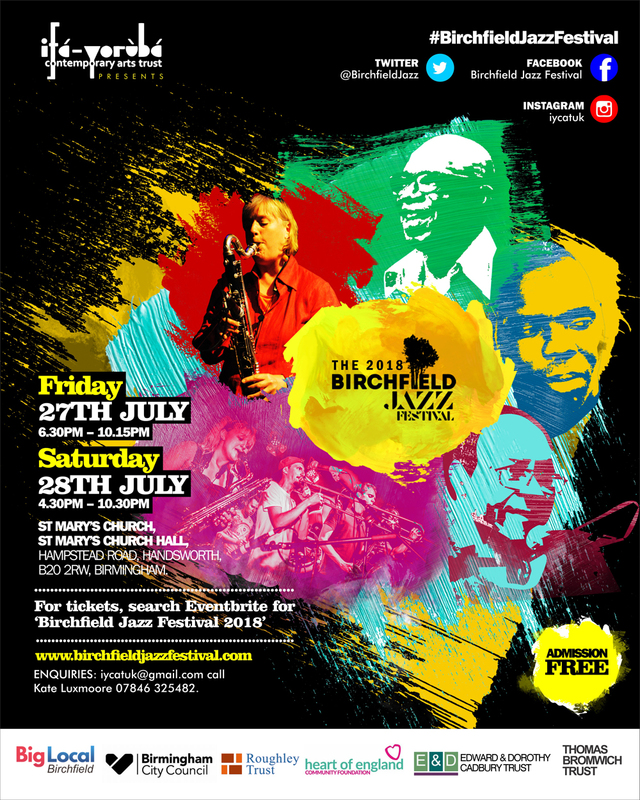 The Birchfield Jazz Festival returns for 2018 – and you’re invited! Following an incredibly successful launch in 2017, this celebratory weekend of free live music returns in 2018 at St Mary’s Church in Handsworth, Birmingham, and you’re invited! Friday 27th and Saturday 28th July should take pride of place in your diaries this year as you secure a place at Birmingham’s first festival dedicated to the Birchfield area. Last year’s event gave us unforgettable performances from the amazing Birmingham Conservatoire Jazz Group, the funky African Roots Fusion band, the melodic Italian composer Sebastiano Dessana and much much more. This year’s event is going to be just as big. Some of the acts already announced include the acclaimed musician Milton Godfrey, local girl Melody Madurie Jones, the impressive Jim Bashford Trio, the fun loving Heavy Beat Brass Band and a special performance from a group of young people, who will be re-telling a selection of stories from elders within the Birchfield community – a compelling project not to be missed. Founded by award-winning musicians Lekan Babalola and Kate Luxmoore through the Ifa Yoruba Contemporary Arts Trust, this jazz inspired weekend aims to showcase accomplished musicians as well as new ones, representing diversity whilst giving us an opportunity to join in and celebrate their musical roots and jazz influences. As professional musicians themselves who have worked across many genres of music, with Lekan receiving two Grammy Awards for his work with jazz diva Cassandra Wilson and blues legend Ali Farka Toure, both Kate and Lekan want the festival to champion jazz in its broadest sense and encourage access to its different styles and genres. The dedicated duo also want to showcase local talent through initiatives such as the Birchfield Jazz Ensemble, a group of young musicians who will playing at the festival, and also continue to nurture the next generation, which they currently do through their programme of arts activities and projects for young people in Birchfield and in association with the Birchfield Big Local.